Start down the "magical" road to "sweet" surprises! 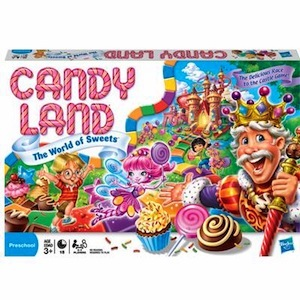 This adorable version to the classic CandyLand game features the colored cards and fun illustrations that kids love, with different "destinations" like Cupcake commons and the chunky Chocolate Mountains. Choose your cards, move your pawn and let your imagination soar as you make your way to the castle to win! Includes gameboard, 4 pawns, card deck and instructions. For 2-4 players. Ages 3 and up.